On Sept. 10, 2006, Katie Winkle celebrated her 14th birthday at her home in Orange, Conn. During that year, she rarely spent time at home. She looked out her front door and noticed nearly 100 Orange residents gathered at the bottom of her circular driveway. Holding handmade signs and wearing T-shirts that read “Kate’s Krew,” onlookers could have easily mistaken the crowd for a protest. Katie looked closer and noticed balloons. She then heard the crowd singing “Happy Birthday.” They were not protesters, but they were gathering for a cause. A few months earlier, Winkle was diagnosed with acute myelogenous leukemia. She was 13 years old. Before the diagnosis came on June 20, 2006, Winkle assumed she had mono. She complained of lethargy and stomach pains two weeks before her pediatrician ordered a blood test and CT scan of her stomach. Winkle recalls the technician telling her mother to call the pediatrician. Something was wrong, and Winkle was immediately taken to Yale-New Haven Children’s Hospital. AML occurs when leukemia cells develop in the body’s blood and bone marrow, according to the National Cancer Institute. While it is the most common type of acute leukemia, adults averaging age 65 are most at risk. According to the National Marrow Donor Program, every year nearly 12,000 adults are diagnosed with AML in the United States. Less than 10 percent of those diagnosed with AML are children. In 2006, Winkle became this rare statistic. To treat the cancer, Winkle underwent six rounds of intense chemotherapy. The treatment resulted in everything from weakening her immune system to causing a stomach infection and complete hair loss. Before Winkle became sick, she had a full head of blond hair. Today the 19-year-old sports dirty brown hair pulled back in a ponytail. With dark green eyes and light freckles sprinkled on her cheeks and nose, the warm color in her face makes it nearly impossible to picture Winkle sick in a hospital bed for months. While Winkle went into remission after her first round of chemotherapy, she was required to complete all six rounds. While she is at a higher risk for the cancer to return, she is still in remission nearly five years later. In addition to chemotherapy and blood transfusions, Winkle cites both her hospital care and positive outlook as factors that restored her health. Since entering remission, Winkle lives life with a pay-it-forward attitude. Every Friday she volunteers on the oncology floor at Yale-New Haven Children’s Hospital through the Circle of Care Program, where she works with families who have children battling cancer. In March 2007 she attended a buddy weekend at Camp Rising Sun in Colebrook, Conn. It is a free camp for children who have battled or are battling cancer. Winkle went as a camper for three years and now volunteers as a counselor. Although Winkle spent time away from her friends, several nurses assumed that role during her in-patient hospital stay. In fact, Winkle’s nurses influenced her decision to pursue a nursing career, specializing in pediatric oncology. Once she graduates from Quinnipiac, Winkle wants to complete a two-year doctor of nursing practice program. Winkle formed a close friendship with registered nurse Lindsay Zuraw, 29, during her stay on the oncology floor at Yale-New Haven Children’s Hospital. In February 2006, Zuraw organized an “end of chemotherapy” party for Winkle in the oncology floor’s playroom. Winkle said she is still frequently in touch with Zuraw. Zuraw says her relationship with the Winkle family surpasses the bounds of friendship. She considers them family. “Our relationship really goes above and beyond the hospital and treatment and IV poles and everything,” Winkle said. According to Beth Winkle, her daughter’s illness brought them closer together and strengthened their bond as mother and daughter. She added that she was proud of the person her daughter became. 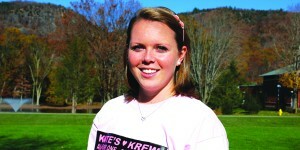 Since coming to Quinnipiac, Katie Winkle has learned to juggle her different roles as a hospital volunteer, Relay for Life Survivorship Committee Co-Chair and most importantly, a cancer-free college student.